Skills training has become a critically important issue for the forest industry and the industry is responding, with a proposal by Canfor and partner the Bid Group to convert Canfor’s permanently closed Rustad sawmill in Prince George to a new trades training school. B.C. independent sawmiller Kalesnikoff Lumber has recently completed a significant upgrade that it expects will provide their mill with the high-speed flexibility to further expand its range of products and markets, and improve recovery. An award-winning systematic energy management approach at B.C.’s Gorman Bros. Lumber is engaging employees and driving down costs—and there is more savings to come. Quebec’s Cossette Brothers are betting on a turnaround in the lumber market, having purchased a closed sawmill in Ferme-Neuve, and invested $3.5 million to get it up and operating efficiently. In close to 50 years of logging in the B.C. Interior, Stamer Logging has stayed ahead of the curve by continuing to adjust to changes, with the most recent change involving a move into high lead logging. Included in The Edge, Canada’s leading publication on research in the forest industry, are stories from the Canadian Wood Fibre Centre, Alberta Innovates - Bio Solutions, FPInnovations, Natural Resources Canada and Alberta Agriculture and Rural Development. As the forest industry continues to recover and strengthen, the COFI conference is a well-timed opportunity for networking, hearing top ranked speakers, learning about key industry issues and opportunities and checking out suppliers. 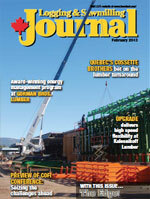 Despite some trying times in the Nova Scotia forest industry, Canadian Woodlands Forum’s logging contractor of the year, Highland Pulp, is working hard to take care of business, supported by the joint efforts of the three brothers who own the company, James, Robert and Kevin Tompkins, and a dedicated crew. Saskatchewan’s Zelensky Brothers have a rich history in Saskatchewan sawmilling, especially on the planing side—and it may not be over yet, if the Prince Albert pulp mill re-opens, creating a chip market. Jim Stirling talks about how pending legislation in Parliament—the Fair Rail Freight Services Act—could help to even out the see-saw relationship between lumber shippers and the railways. For an answer, the industry can look to Gorman Bros. Lumber in British Columbia, which was recently recognized by provincial power utility BC Hydro as a leader in industrial energy efficiency. The company is well on its way to realizing more than $500,000 in energy savings, through a systematic approach that has everyone in the company involved. 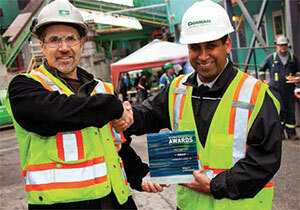 Key to the savings is Gorman Bros.’ Strategic Energy Management Plan, which was developed with support from BC Hydro. That focus, over just two years, has yielded more than 4.6 GWh in annual energy savings (that’s about $276,000 based on B.C. electricity costs), with more to come. Launched in the 1950’s as a fruit-box manufacturer, Gorman Bros. Lumber is a 60-year old family-owned company, with four facilities in B.C. and one in Washington State. Its Westbank, B.C. 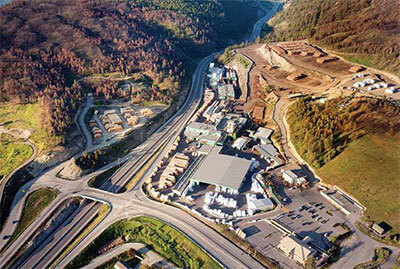 operation is considered to be one of the largest board mills in the world, producing 150 million board feet of 1” spruce and pine board per year, for shipment to 28 different countries. A quest for continuous improvement is one of the company’s keys to success—and one of the reasons it launched its energy efficiency program. Curt Kallen (left) energy manager for Gorman Bros Lumber receives the Power Smart Excellence plaque from BC Hydro Key Account Manager Kal Sahota. The company is well on its way to realizing more than $500,000 in energy savings. “Whenever there’s an opportunity of cost savings or of doing something better, we take a look at it,” says Tracey. “We’ve always put in premium high-efficiency motors and we put in VFDs (variable frequency drives) when we do a capital project. Because we always bought the Cadillac when it comes to energy-efficient options, we thought we were running a pretty tight ship. Gorman Bros.’ efforts began with an Energy Management Assessment to identify energy-saving opportunities. From there, they hired a full-time energy manager, and developed their Strategic Energy Management Plan (SEMP), which identified 8.8 GWh of potential energy savings (worth about $500,000 per year). The company followed its historic practice of investing in capital projects during market downturns when implementation costs are lower, launching its energy efficiency work during 2010. Projects have included equipment upgrades and added controls, tagging and fixing 75 compressed air leaks, energy efficient lighting, fine-tuning the loads on fans and installing a new energy efficient dryer. Impressively, more than 1.2 GWh of the savings were captured with zero capital cost, simply through educating employees about energy-saving behaviour changes. “I think what shocked the employees was how much energy is required not just to run the sawmill overall, but the details of what it takes to run air compressors and what leaks cost you,” says Tracey. Gorman Bros.’ comprehensive employee engagement program includes newsletters, a suggestion box, incentives, monthly scorecards and air leak tag stations, ensuring staff are fully on board with energy reduction efforts. Tracey says the comprehensive, staff-involvement approach allows the company to find energy savings that would be hard to capture without employee buy-in. While it’s understood that investing in energy efficiency cuts costs, the impact on customer relations—especially in commodity markets—is less often considered. However, Tracey says Gorman Bros. is building value here as well. “Globally, people are looking for companies that have certification. They want to see a company that is well run, that’s going to be there for the long term,” he says. “You can’t afford to waste anything these days. Customers are looking at the quality of your wood fibre but also at what do you do with your byproducts and how well you’re managing the resource that you have. We get plenty of those questions. And they’re impressed when we show them our scanning technologies or when we describe to them how much electrical savings we get with VFDs. 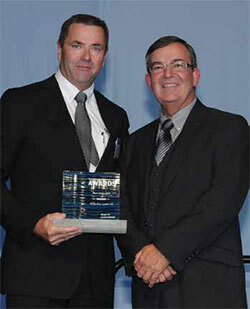 Doug Tracey (left), operations manager for Gorman Bros Lumber, accepts the Power Smart Excellence Award from Charles Reid, President & CEO, BC Hydro. Due to the company’s consistent and effective focus on energy efficiency, Gorman Bros. was recognized in October by BC Hydro as a “Power Smart Leader”—the coveted highest level in the utility’s “Power Smart Excellence Awards” program. Tracey says it’s powerful recognition. “I think it sends a message. We compete in a global economy. Our customers are concerned about environmental footprint and the sustainability of energy going forward,” he says.